Use the machine learning program Wekinator and an Arduino UNO to create your own color sorter! In this article, part 2 of a larger machine learning series, you will learn how we can make a color sorter using machine learning. We will train Wekinator to control the LEDs (connected to the Arduino) based on the color of a piece of paper we will show in front of the webcam. We will give the input to the Wekinator from the webcam using the processing code, and after training the Wekinator, the output will be received by processing, which will further send it to the Arduino, where the LEDs will light up. If you missed part 1 of the Wekinator series, click here to familiarize yourself with the platform before moving on! 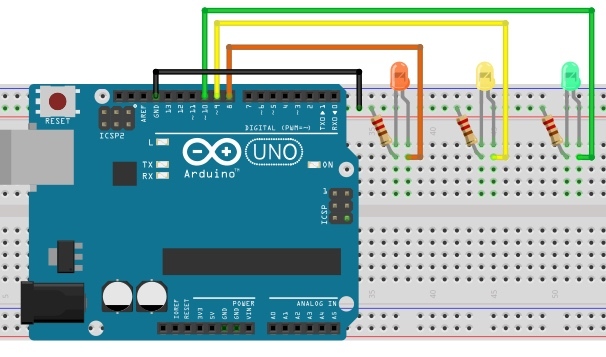 First of all, paste the code given for the Arduino in the end of this post in the Arduino IDE and upload the code. Then you will need to download the sketch from the examples page of Wekinator. 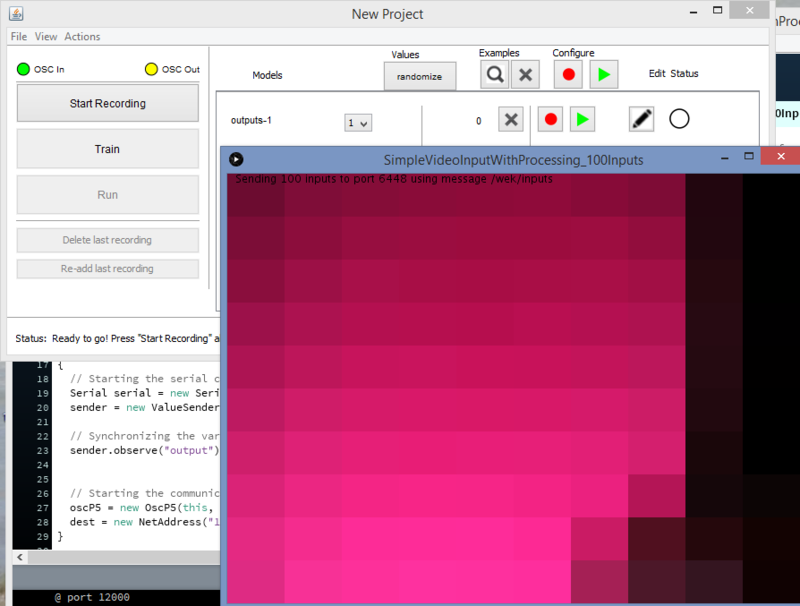 Download the source code to process a simple 10x10 color grid. Unzip it and run the code in processing. This program will use the webcam of your laptop, and depending on what you are doing in front of the camera, it will give the input to the Wekinator. You will need another sketch for the output from the Wekinator. The code for that sketch is at the end of this post. Paste it into processing and run the sketch. This sketch will take the output from the Wekinator and send it to the Arduino, where the LEDs will light up. 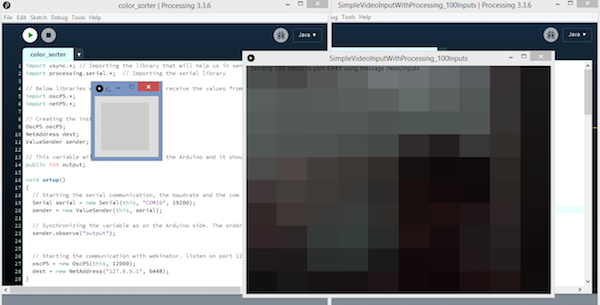 Both the processing windows should look like shown below. 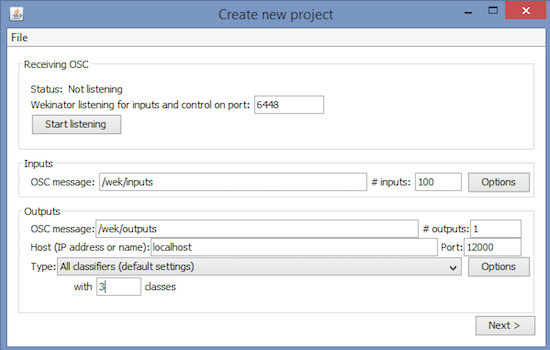 Now open Wekinator and make the settings as shown in the below figure. Set the inputs to 100 and the outputs to 1. Set the type to All Classifiers with 3 classes and click on next. Hold a colored paper in front of the webcam and start the recording for half a second. Now change the class to 2. Again, show the webcam a paper of another color, and start the recording for half a second. Now change the class to 3, show a paper of yet another color, and start the recording for half a second. After that, click “Train”, then click “Run”. Now the LEDs connected to the Arduino will light up according to the color you show in front of the webcam. ValueReceiver<1> receiver;  /*Creating the receiver that will receive only one value. // Synchronizing the variable with the processing. The variables must be int type. // Synchronizing the variable as on the Arduino side. The order should be same.